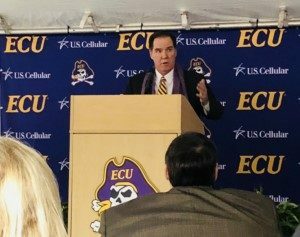 Greenville, N.C. – Groundbreaking ceremonies for East Carolina University’s Southside Stadium Renovation Project were held Thursday, while construction crews worked in the background. The project will add 1,000 premium seats to the southside tower, a new press box, and updates to the Ward Sports Medicine Building. Coming in at $60 million, the renovations are estimated to be complete before the 2019 football season.